SDP/SI offers 200 inch and metric dimensioned feed and idler rollers for multiple applications. Typical applications include: copiers, printers, money or dispensing machines, vending machines and paper transport. 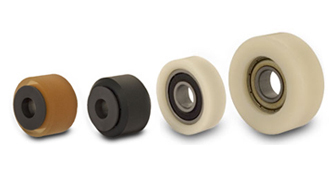 SDP/SI feed and idler products provide excellent performance due to the urethane 60 durometer rolling surface. Outstanding features include high-load bearing and shock-absorption capacity, noise reduction, low-rolling resistance, resistant to flat development and wear. They are especially resistant against compression under static loads. The feed and idler rollers are easily installed on drive shafts via adhesive bonding, press fits on knurled shafts and set screws. Small inch and metric sized idlers are available in all stainless steel construction or as a lower cost option an idler with sintered bronze bearings in stainless steel housing.